This was my ride: The Nozomi Super Express N700 Bullet Train. It’s set to arrive in Nagoya station after a 1-hour, 40 minute ride from Tokyo, which was about 170 miles away. A short taxi ride from the station and I arrived at popular Japanese company, Atelier Boz. The brand shop is located on the fifth floor of the SakaeNOVA building. I am to meet Shiva, the Brand Manager and Head of Operations of Atelier Boz. No outfit can be complete without accessories, and Atelier Boz highly encourages this. Pictured here is the Frandeer Dress with a Rosary pendant chain. The Melec Blouse, as shown above, advertises the label’s attention to detail. The white corsage enhances the look even more. 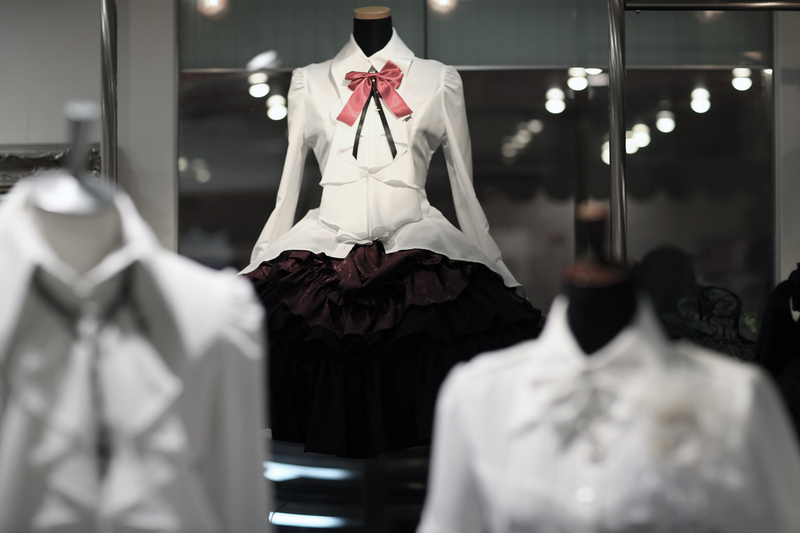 The outfit on display is a special collaboration with a Japanese Visual Kei band called AvelCain. Fabulous. After two hours, we said our goodbyes and I was on my way to catch the bullet train back to Tokyo for another meeting. A big thank you to TaeYeon for translating. Separator image Posted in Fashion, Travel and tagged with Atelier Boz, AvelCain, Formal, Gothic, Nagoya. Shiva is so amazing. ❤ Such a dreamlike life! She is really a hard worker too! I am always in awe of her, too! Shiva has an outstanding style! It is so cool to see what it is like inside the shop! Love Atelier Boz! Those boots are amazing!!!!! Shiva-san is such an inspiration to me and I was always curious to see what the inside of one of her shops look like!! I can’t wait to visit her store when I travel to Japan one day.